With Labor Day having come and gone, it is now time to say goodbye to the delicious fresh peaches of summer. I always have a hard time with the end of peach season, since they are one of my favorite things to bake with. I’m also allergic to apples, so fall baking is a bit more difficult. Most of my fall baking features pumpkin, with an occasional pear dessert or two. This summer brought a number of peach crisps. I found that peaches from certain areas along the East Coast were hit with an unfortunate hailstorm early on, and their flavor suffered. There were still great for baking though! 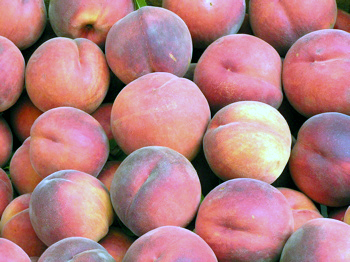 My local farmers market had the Encore variety of peach this past weekend, one of the final varieties (hence the name). I may be able to find a few more baking peaches over the next week or so, but then it is on to fall. Bring on the pumpkin!